As Winter approaches I adore seeing the wonderful colour combinations that can bring a Wedding to life. Winter weddings in Ireland are truly magical! From Icy Whites to Berry Red. 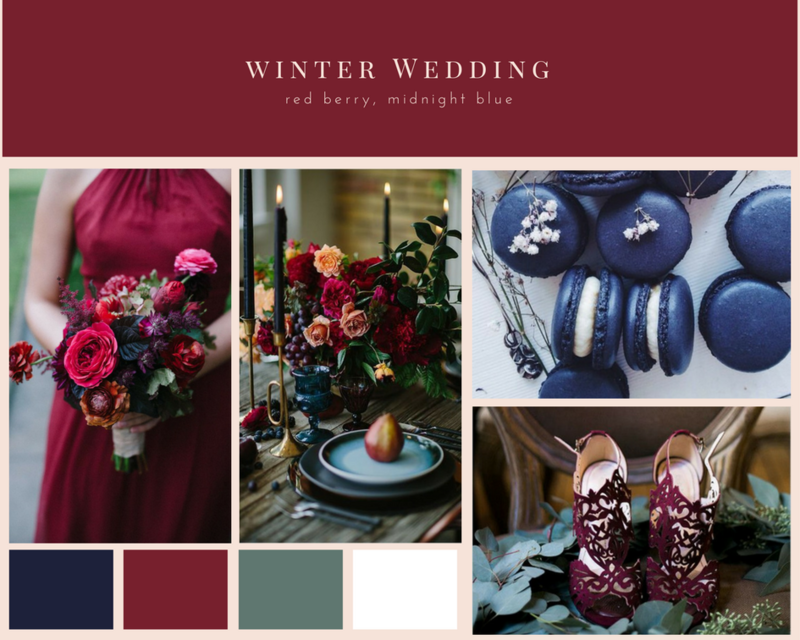 I have put together a Mood Board based on one of my favourite colour combinations at the moment – Red Berry and Midnight Blue. The colours you choose for your wedding usually coincides with the season you get married. The days may be shorter in winter but the darker days can make for a more romantic wedding and reception. Lots of candles, low lighting and an open fire will make for a lovely wedding day. Wedding venues are usually cheaper at this time especially if you plan your wedding for after the holiday season. You can still get the benefit of a beautiful romantic winter wedding at a reduced price due to the slow season after the holidays. Chances are that you will also get your dream venue in Ireland because all the Christmas festivities will be over. Winter is, in itself, a theme so you won’t have the added burden of choosing a theme for your wedding. This makes your wedding that much easier to plan! Another great thing about getting married in winter is that your guests will usually be available. Choosing your dress for a winter wedding can also include choosing a lovely fur wrap in case you have an opportunity to take pictures outdoors. So you can still have your perfect dress and stay warm. You’ll also need to keep in mind that your bridesmaids will also need to stay warm so they may need a wrap or shawl also. The weather will definitely be a factor and can make for some tense moments simply because of the unpredictability of the season. Planning a winter wedding in Ireland you will be guaranteed that it will be cold! ← Previous Previous post: Donut Wedding Displays – The Hottest New Wedding Trend!